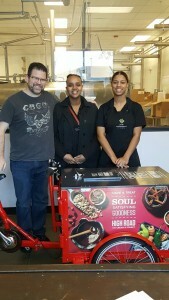 Cross Keys students were challenged by High Road Craft Ice Cream to develop a new ice cream flavor. Cross Keys High Schools students participated in the first Youth Entrepreneurs Ice Cream Taste Off on Saturday, March 4. Youth Entrepreneurs (YE) is a high school program that helps students discover fulfillment through the creation of their own business idea. 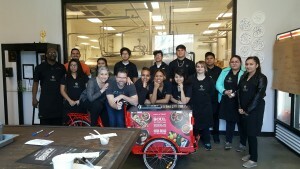 The YE students were challenged by High Road Craft Ice Cream to develop and bring a new ice cream flavor to the market. Winners of the ice cream taste-off created a churro and cheesecake flavor combination. “These amazing students have put together some fantastic flavors based on world cultures,” said Nicki Schroeder, Co-Founder and Chief Customer Officer for High Road Craft Ice Cream & Sorbet. Four teams from Cross Keys HS pitched their flavors at the High Road Craft tasting room located in Marietta. The public was invited to taste and cast their vote for the winning flavor. The students interviewed culturally diverse audiences of all ages to determine their two flavor combinations. The different flavors created included coconut milk and coffee, churro and cheesecake, Belgian waffles and maple syrup, and mango and jackfruit. The winning combination was the churro and cheesecake flavor. The next step in the process is for the chefs at High Road Craft Ice Cream to further develop the product and hopefully bring it to market. The sales proceeds would benefit Youth Entrepreneurs. Youth Entrepreneurs is a yearlong, elective program that instills the business skills, original thinking, and personal values necessary to succeed in today’s market and in life. The program’s focus is to create new opportunities for both students and the community.